Columbia md Beauty Salon tells truth on How A Brazilian Straightening Treatment Works | Best Salon and Spa in Columbia MD! Want to tame frizz and curl? Get hair that’s way more manageable without the maintenance? Well, you’re in luck! Thanks to keratin hair treatments, you can get just what you want. Here’s how it works: we apply a keratin solution to infuse your hair its own building block. This step deep conditions but does not straighten your hair. After this application, we then apply another solution that does straighten your tresses. Once your hair is completely dried, a super hot flat iron is used to seal in moisture, and again, condition your hair. It sounds counter intuitive to apply such hot temperatures to your hair, but this step is essential! Now you can look in the mirror and see straight, glossy, healthy hair. No more fighting with unruly curly locks. Our clients tell us this treatment cuts down styling and management time by half, even more! And the good news is the whole process takes about 90 minutes. 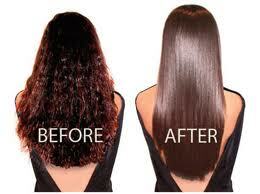 Depending on your hair type, you will have lasting results from 2-4 months. Great, huh?